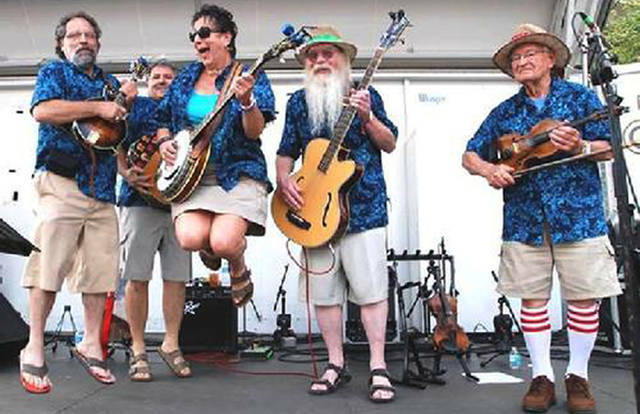 Rum River Blend will play a concert at 7:30 p.m. April 27 at the Troy-Hayner Cultural Center. TROY – The Troy-Hayner Cultural Center hands-on music workshop at 6:30 p.m. April 27 followed by a concert at 7:30 p.m. with Rum River Blend. At the workshop, children will have the opportunity to work with instructors to learn to play a few notes on the same type of instruments that Rum River Blend uses. Then everyone will pile up in the Ballroom for a concert with the band and its famous kazoos. Rum River Blend is a bluegrass staple of Troy. The band has teamed up with the Hayner for more than a decade to bring its happy version of that American bluegrass sound. On April 27, Linda Tatarian will play the five-string banjo, Chris Tatarian will play acoustic guitar, Smiling Bill Benning will play his electric bass guitar, Mark Acton will play mandolin and fiddle champion Carl Phillis will join the group as well. For more information regarding these free events and to receive a complete listing of events taking place at the Hayner Center, call 339-0457 or visit its website at www.TroyHayner.org.